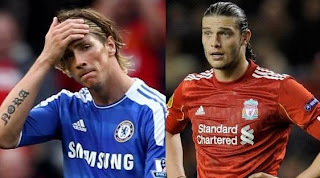 Revelations this afternoon as it has been suggested that Fernando Torres might be considered in a return to Merseyside as part of a straight 'swap' deal with Andy Carroll moving the other way. Both strikers have seen a downturn in performance since their respective mega-money transfers a year ago. Many feel that the two forwards might well be better suited to the style of play at the alternative clubs. Blues fans still believe that Torres will prevail but time is running out for the Spain international. Andre Villas-Boas has gone on record to say the former Red is not available 'at any price'; might an exchange be more attractive to the struggling Portuguese? Sources from Anfield have commented that Carroll seems to be fourth or fifth when it comes to selection - even during play - and team-mates have been less than sympathetic when discussing training ground work. The ex-Newcastle striker would relish a change of fortune although a move further south might not be realistic. Stranger things have happened - what do you think?